This incredibly slim 42 inch wall mount offers hundreds of different colour options from its unique Triple Fire system. The system is made up of 3 individually controllable energy saving LED coloured flame effects and 8 LED back light colour options (optional on surface mount installations only.) The fireplace can be easily surface mounted and partially or fully recessed into the wall, and hardware is included for all three types of mounting. The energy saving programmable room temperature shut off puts you in control of the heat, having it automatically turn off the heat when it reaches the room temperature you select while you still enjoy the flames. Introducing Real Flame's exclusively designed Grand Series. The Callaway represents a new generation of Real Flame electric replaces. The 40 inch (diagonal) Grand Series rebox is 30% larger than our standard rebox, achieving incredible realism and clarity. Featuring a clean and classic design bringing an element of beauty typically reserved for custom installations the Callaway will dene your living space. Features of the VividFlame Grand Series electric rebox include 1500 watt infrared heating, remote control, programmable thermostat, timer function, brightness settings, and ultra bright LED technology. The Callaway is available in Chestnut Oak or White nish. Classic meets traditional in the Harlan Grand Fireplace Mantel. Striking moulding and an offset fagade frame the contrasting trim of this grand replace. The VividFlame Electric Firebox plugs into any standard outlet for convenient set up. The features include remote control, programmable thermostat, timer function, brightness settings and ultra bright Vivid Flame LED technology. The Harlan Grand is available in Black with White surround and White with Black surround. Timelessly styled, the Marlowe Electric Fireplace displays your favorite items and media components behind elegant glass and mullion doors, while adjustable shelves and built-in cable management keep everything organized. The VividFlame Electric Firebox easily plugs into any standard outlet with features including remote control, programmable thermostat, timer function, brightness settings, and ultra-bright VividFlame LED technology. Available in Black and White nishes. 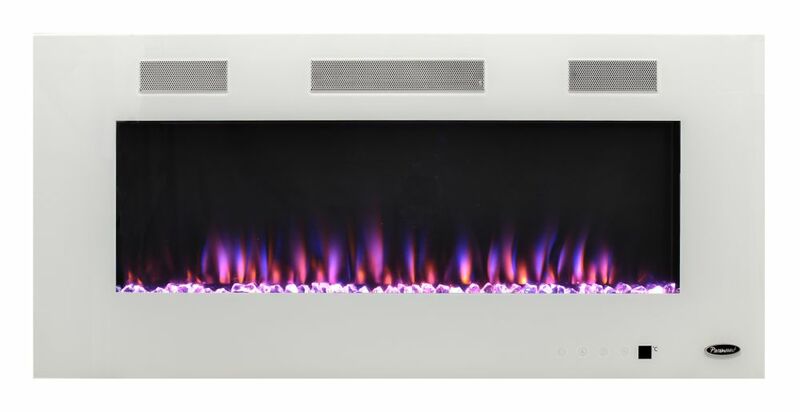 42-inch Electric Fireplace with Bonus Media Kit in White This incredibly slim 42 inch wall mount offers hundreds of different colour options from its unique Triple Fire system. The system is made up of 3 individually controllable energy saving LED coloured flame effects and 8 LED back light colour options (optional on surface mount installations only.) The fireplace can be easily surface mounted and partially or fully recessed into the wall, and hardware is included for all three types of mounting. The energy saving programmable room temperature shut off puts you in control of the heat, having it automatically turn off the heat when it reaches the room temperature you select while you still enjoy the flames.